Susan Ingraham, Sea Belles president (right) receiving Karen Gordon Scholarship from Diana MacDonald, Scholarship Chair SCotianAires Chorus. Sea Belles A Cappella Chorus recently received the Karen Gordon Scholarship. 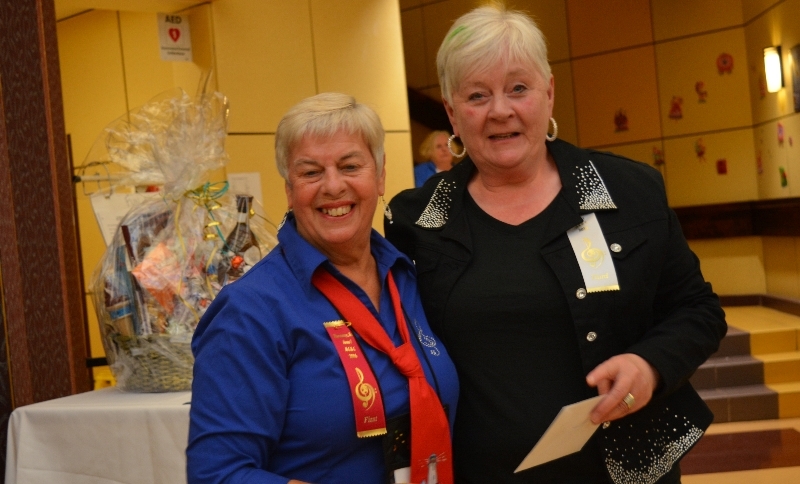 The award was presented to Sea Belles’ president Susan Ingraham by ScotianAires Scholarship Chair, Diana MacDonald, at a recent competition that took place in Sackville. The Karen Gordon Scholarship is named for the late Karen Ruby Gordon, a young member of the Halifax based ScotianAires who died tragically on her way to a chorus practice in 1992. Awarded annually, the scholarship assists one Atlantic Chapter to acquire an out-of-province coach for educational purposes. Sea Belles also recently received funding for another coaching weekend from Sing Canada Harmony, a registered Canadian charity that provides financial assistance for education and training in all aspects of music performance, leadership, directing, arrangement, adjudication and staging. With approximately 55 members, Sea Belles is directed by Janet Kidd of Hampton, NB. The chorus presented two songs at the area contest to earn its placement, I’m Afraid the Masquarade is Over and Alexander’s Ragtime Band. These selections are a small sample of the chorus’ extensive repertoire, which is ideally suited for a wide range of audiences and events. To learn more about the chorus’s upcoming performance schedule, visit www.seabelles.ca.